Many women nowadays are focusing on getting stronger, and we are so excited about it! While we honor and respect anything that each person wants to do with their own body, we hold strength training close to our heart. While working towards strength can be really exciting, it can also be a bit frustrating at times when progress seemingly comes to a screeching halt. Not to worry, though! We’ve been strength training for a long time, and have solutions to help you bust through your strength plateau. Strength gains aren’t linear, particularly in intermediate lifters, and especially with advanced lifters. This is why it’s not uncommon to see advanced lifters celebrating a Personal Record (PR) of finally adding 2.5 pounds to their huge squat or deadlift. While it may seem like a very small addition, advanced lifters sometimes work for months and months to be able to add that on. Women who are new to lifting weights often experience a wonderful phenomenon fondly referred to as “newbie gains.” It’s very likely that a new lifter will be able to increase the load that they are lifting week after week for many months, assuming that they stay consistent with their training. Eventually, as the lifter becomes stronger and is able to move more weight, the weight increases will become less frequent. While this is normal and to be expected, this is typically when a person erroneously thinks that they’ve hit a plateau, and tries to overhaul their training, convinced that it’s no longer working. While it may be frustrating to notice that strength gains are slowing down, it can also feel exciting. This means you’ve reached the point where you’ve moved beyond the point of newbie gains, which is progress in and of itself. Congratulations! If you are a beginner or intermediate lifter who has stayed incredibly consistent, and you haven’t been able to increase the weight you’re using on most of your lifts in three to four weeks, it may be time to take a look at the following things. One of the most common mistakes we see when someone is working to get stronger is spending too much time testing their strength rather than building it. Most people are working at their max effort far too often. The majority of your time should be spent building your strength, not testing it. Testing your strength, session after session, can prevent you from progressing. For example, let’s say that Jamie is able to squat 100 pounds for five sets of five reps. 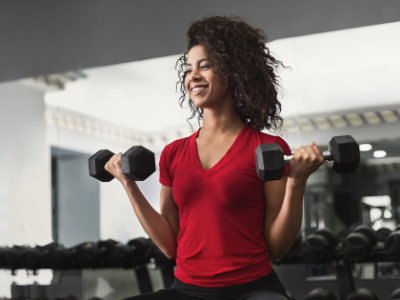 However, they are very difficult for her: she has to grind through those reps, and she couldn’t possibly do another if she had to — 100 pounds for five sets of five reps is her max effort. She really wants to get stronger, so every time she squats, she tries to use the maximum weight possible (which in her case is 100 pounds). What Jamie doesn’t realize is that working at her max over and over again will likely leave her stuck at the same weight. For the most part, we like to see people leaving anywhere from one to two reps “in the tank” when they are training for strength. This means that you should be able to perform one or two additional reps if you absolutely had to. Additionally, while you may have already assumed this by now, this also means that consistently missing lifts (also referred to as failing a lift) is a big sign that you are working at too high of a percentage. Missing lifts will happen, but it should be rare, and limited — for the most part — to the times that you set out to actually test your max. For example, if you want to see what your one-repetition maximum (1RM) is, you may work up in small increments and then finally miss the lift, which will establish your max, and provide other valuable information, such as where your form broke down and why. Testing your max is typically done at the beginning of a strength training cycle, and then not again throughout the cycle. Another reason why many people become stuck with their strength is that they are attempting to train in the same way and at the same intensity all year long. In order to make progress with our strength, we need our training to fluctuate throughout the year. Not only are different cycles necessary to get the best results, but with a little forethought, you can plan your annual training cycle so that it better aligns with your life, lifestyle, and what you have going on. For example, some people — like myself — choose to focus on strength or hypertrophy over winter, because we tend to eat more in the colder months, and sleep more due to less daylight. More fuel plus extra sleep for recovery is optimal for gaining strength or packing on muscle mass. Another example may be scheduling your hardest training cycles during the year when there aren’t other stressful things going on (holidays, tax season if you are an accountant, or finals if you are a student). How you set up your annual training cycle will be unique to you, your lifestyle, and your priorities, but it’s important to cycle your training throughout the year in order to get the best results, allow for adequate recovery, prevent burnout, and keep the gains coming. Constantly changing things up is not an effective way to develop strength. The people who are the strongest have gotten there by showing up day after day and working really hard on the basics. I understand the desire for change and spicing it up, and there is a lot of value in moving in many different ways. However, constantly changing up your training is not an effective way to develop big strength. Sticking to a program also ensures that you are doing important exercises that you may not have selected on your own. While it’s crucial that you enjoy your training in order to help you stick to it, a good training program is going to require a bit of give-and-take. There isn’t an effective strength training program out there that is only going to include all of your most favorite exercises. There will surely be some exercises that you don’t love. Remember that it’s likely that those are the movements you struggle with, which also means they are the ones that may be the most beneficial for you. Put in the work with your strength training program by doing what it calls for, and make it more enjoyable by recruiting a fun training partner, or putting together a music playlist that gets you fired up. When we say “recovery,” we aren’t just referring to rest. Rest and recovery are different. Rest means that you took a day or two off from strength training, or spent some time snuggled up on the couch with a good book. While these things are important — and recovery does includes some rest — recovery is more multifaceted than merely resting your body. Consuming nutritious and well-balanced meals to the best of your ability. Doing things to help you manage your stress levels, such as taking a leisurely walk, doing restorative yoga, or meditating. Your recovery is just as important — if not more so — than your actual training sessions. If your training progress is suffering, ask yourself if you have been giving recovery your best effort. If not, consider which things you can do to improve it based on some of the ideas mentioned above. How long has it been since you’ve taken a deload? Deloads look a little differently for each person, but in general they’re comprised of 5–7 days either taken completely off from strength training or intense exercise, or using significantly less volume and load (20–30 percent less than what you usually use) and performing easy recovery workouts. Deloads can be challenging for those who really love to lift. However, it’s important to periodically incorporate them in order to keep building strength. Deloads are important mentally and physically, especially after a big strength cycle. If you’re unable to progress with your strength gains, and it’s been more than 12 weeks since you’ve taken 5–7 days off from strength training, consider a deload in order to get you moving forward again. Last, and most importantly, in order to make progress with our strength training, we must have periodization. Periodization, to over-simplify, means proper and appropriate progressions. It’s absolutely crucial to find a program that understands the importance of periodization if you want to continue to move forward with your strength training. As you can see, there are a lot of ways to get your strength moving again in the right direction. The most important thing is resisting the urge to do a complete overhaul. Instead, take some time to analyze exactly what you’ve been doing, and which areas can use some improvement. Tired of not getting the health and fitness results you’re looking for? 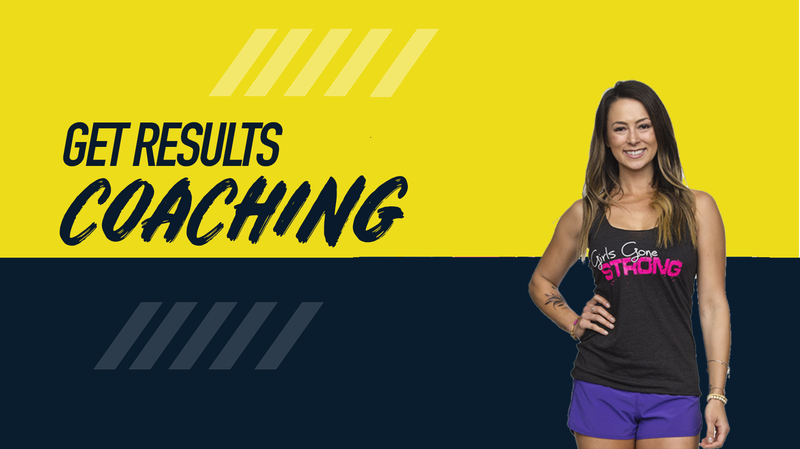 Our small group Get Results Coaching program gives you everything you need to accomplish your goals – with GGS co-founder and head coach Jen Comas right by your side. Enrollment opens twice a year – get on our free, no-obligation pre-sale list now to learn more and get an opportunity to enroll early.